Here's probably the easiest baked fish recipe. 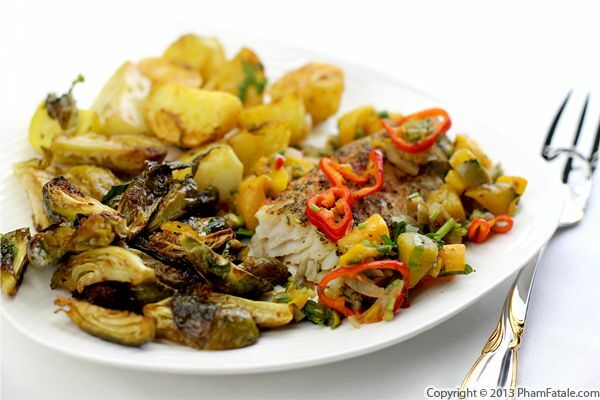 Swai fillet (catfish) is seasoned with Bellindora seasoning, smoked paprika and cayenne pepper. Then, it's pan-seared with a combination of olive oil and butter and transferred to the oven until fully cooked. I use the combination of fats so that the butter doesn't burn. Right before the end of the cooking time, peach relish is spread over the fish to add a sweet and acidic flavor to the fish. The peach relish is made with canned peaches, a lot of Italian parsley, pickled spring onions, Bellindora balsamic peach vinegar and red mini sweet peppers. It adds a brightness and freshness to the dish. I can't wait for peach season to make the dish again with fresh fruit! 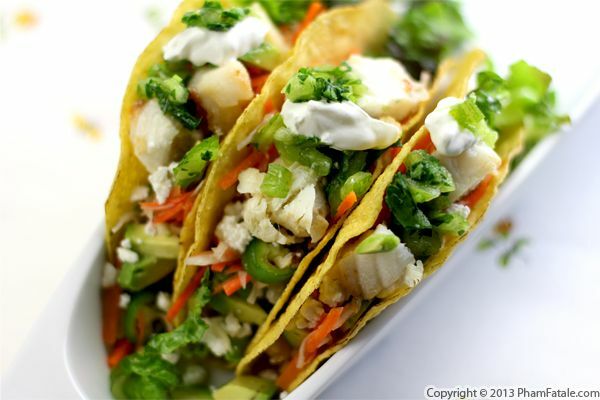 These fish tacos are filled with grilled halibut, cilantro lime rice, salsa verde, diced avocado, shredded lettuce, crumbled queso fresco, pickled jalapeños, carrot and daikon (the Vietnamese flair in these tacos) and finally a dollop of Mexican sour cream. After completing my second cookbook, (shameless plug: don't forget to pre-order my Banh Mi cookbook), I've been professing my love for the Vietnamese sandwiches to whomever I meet on Twitter. Last weekend, I came across the most wonderful idea from a Texan food & wine festival through Chef David Bull from Austin: Banh Mi Tacos. In my second cookbook, I kept everything fairly traditional by sticking to straight, authentic recipes for the Vietnamese baguette, đồ chua (pickled carrots and daikon) and Vietnamese-style meat. But what I love most is the way we can get inspired from a certain type of cuisine and come up with new, creative dishes. If you've been following my culinary adventures for a while, you probably know how much I love seafood. There's a French word "gourmande" that merely translates to "greedy" and I think it accurately sums up my personality when it comes to les fruits de mer (seafood). Thus it was fitting that at the Asian market this week I bought way too many crabs (again)! Lulu's grand-uncle, who also enjoys crab, came to visit us, so I made a few crab appetizers for him. At first, I didn't know how I was going to present the crab, but I finally settled on savory "cookies" flavored with Dubliner cheese. 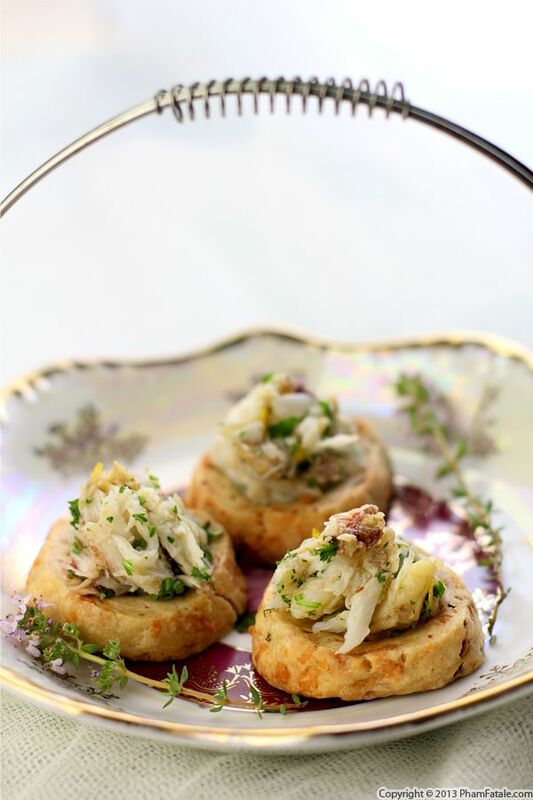 A bit of cottage cheese serves as the "glue" for the whole appetizer, and the depression in each cookie is perfect for a spoonful of crab meat. This crab soup , simply called súp cua in Vietnamese, was my attempt to finish the leftover crab from last night's dinner. We bought six crabs for the two people who actually eat seafood in our house, so there was a fair amount unfinished. I prepared cua rang me (Vietnamese tamarind crab) and that's basically all we ate with a little salad on the side. We were so full by the end of the meal that we could not finish the dish. It was our Mount Everest and we didn't conquer it! I didn't want to waste the delicious crab, so I cracked the rest and gathered the crab meat. I had chicken stock in the freezer and I thickened it with a little corn starch. 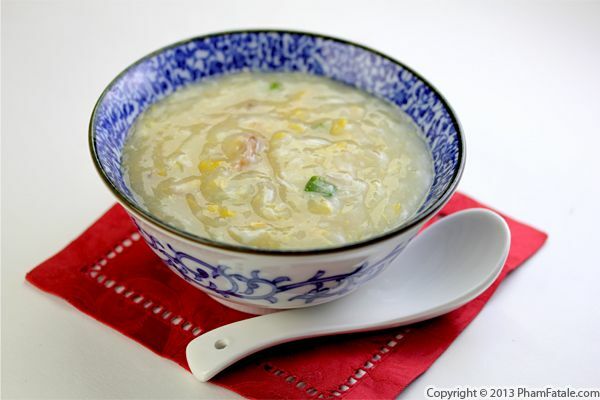 I added frozen corn and green onions to the soup and the result was just as I expected: mildly sweet, velvety and wonderfully soothing. Simply perfect! We had a giant seafood feast last weekend, and believe it or not, we cooked 12 whole crabs. The main flavoring of this dish was fermented black beans, which are very common in Asian cooking. I also added fresh green chiles and a lot of Thai basil leaves. 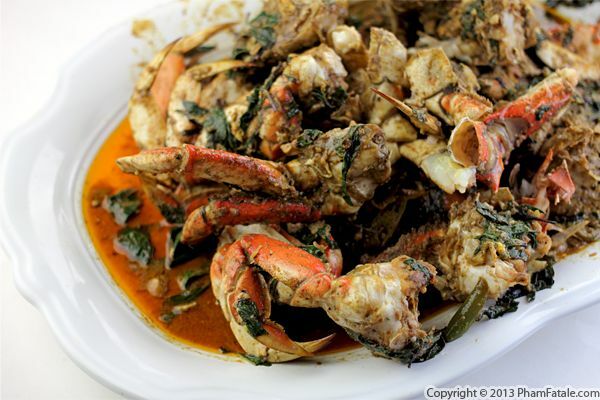 The crabs are prepared in two steps. First, they're fried, and then to finish them off, they are stir-fried with the fermented bean sauce and a bit of cooking wine. It gets a bit messy around the stove, but the result is worth the effort! Page 19 of 28 pages.